Using your lawn mower can help you keep your garden in top condition. However, if you want to be safe while you employ it, be sure to follow the tips in this post by Superior Synthetics LLC In Clintonville. Call Superior Synthetics LLC at (715) 823-6525 to acquire products for your small engine's maintenance, such as the best synthetic oil in Clintonville. While it's true that all lawn mowers do the same thing (mowing the lawn), not all of them work in the same way. Not only that, but you should consider that even though it has a small engine, it's still a complex machine that you need to treat with care. To that end, it's highly recommended that you read the owner's manual thoroughly, so you can get the right information about it. For example, reading it will teach you how to operate it, how it works, and how you need to take proper care of it. One thing to really think about is that you could end up really hurt if you aren't careful with your lawn mower. For that reason, it is imperative that you treat it with respect, and that you aren't a reckless user, since you could put your and other people's well-being at risk. 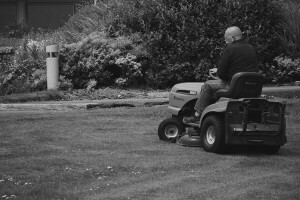 To prevent a disaster, you need to follow a few tips: never, ever ride your lawn mower if you've been drinking alcohol or doing drugs, as this could impair you; likewise, be sure to always keep your eyes on the 'path' you're taking; and you shouldn't leave it on and unattended, either, as this could lead to an accident. Once again, your lawn mower is a complex machine, even if it has a smaller engine. This means you need to handle it as you would any other vehicle, and that you need to maintain it properly to ensure it will remain in good condition and safe to use a lot longer. To that end, you should follow the maintenance tips in the owner's manual. Other than that, you should have a professional mechanic look at it with some regularity. Also, don't forget to pay attention to it while you operate it, so you can take note of any issue that may arise, and tend to it before it leads to less-than-ideal consequences. Buy AMSOIL 10W-40 Synthetic Small Engine Oil, the most effective synthetic oil in Clintonville for your small engine. If you want to stay safe while on your lawn mower, you need to take a good look at the clothing you wear while you use it. This is because, neglecting this could put you in a difficult position. For example, you should be wearing the right footwear (sturdy, closed-toe shoes) to avoid a mishap. Your clothes should also be fitted, as something that's too long or loose could end up getting caught in the machine's mechanism. Finally, if you'll be working outside on a sunny day, you should do what you can to protect yourself from the sun (wear sunscreen, sunglasses, and a hat). Children and lawn mowers aren't an ideal mix, since the former can get up getting seriously injured because of the latter. That's why it is imperative that you take some extra safety measures if there are children in your household. For example, keep them from going outside if you'll be mowing the lawn. Of course, you should absolutely keep them from riding the lawn mower, as that's a recipe for disaster. As a last tip, make sure their tiny hands never ever reach for the lawn mower's blades, as this could have disastrous consequences. If something gets caught on the lawn mower's system, it could ruin the mechanism, or it could be thrown out from under it with great force. That's why, it's necessary that you check the area you'll be mowing before you begin the task. If you happen to see any toys, branches, rocks, or other item laying around, be sure to remove them before you begin, to avoid accidents or other mishaps. Finally, if something were to get stuck on the lawn mower's blades, you need to act with extreme care to avoid getting injured. For starters, you should never reach for the object if the mower is still on, so make sure to turn it off before you work on getting it unstuck. After that, try to avoid touching the blades as much as possible. If you can, you could even use tools, so you don't hurt your hands. Call Superior Synthetics LLC at (715) 823-6525 or stop by AMSOIL's online shop to get the products your small engine needs.